Week VII brought success and smiles to many riders during the Ocala Tournament. 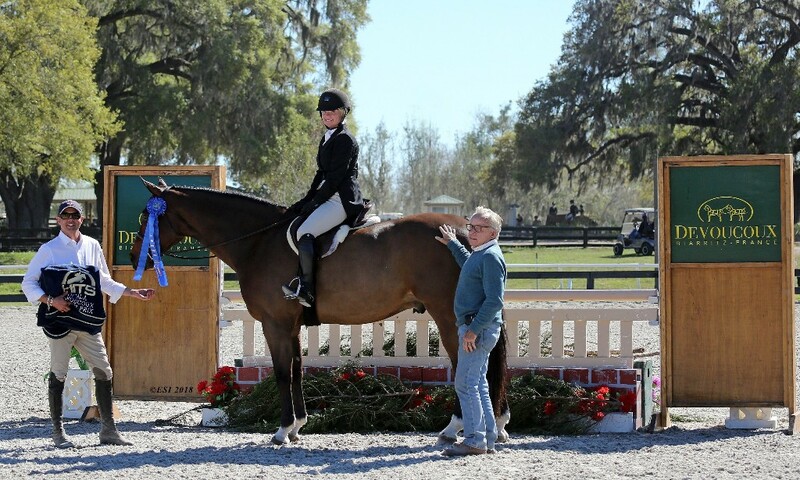 Grand Prix riders and Beginner riders, alike, jumped through another week of the HITS Ocala Winter Circuit with many blue ribbons to be awarded. Kicking off the week in the Ocala Horse Properties Stadium, Aaron Vale took first place in the $5,000 Johnson Horse Transportation Welcome aboard BONZINI S with a jump-off time of 39.303. Only tenths of a second behind him was Mattias Tromp aboard EYECATCHER with a jump-off time of 39.460. Third place was Callan Solem aboard DAVIDSON with a jump-off time of 41.870. Solem also placed fourth with IMOGEN DE REGOR in a jump-off time of 42.350. Fifth place went to Harold Chopping and FANTOM with a jump-off time of 42.380. 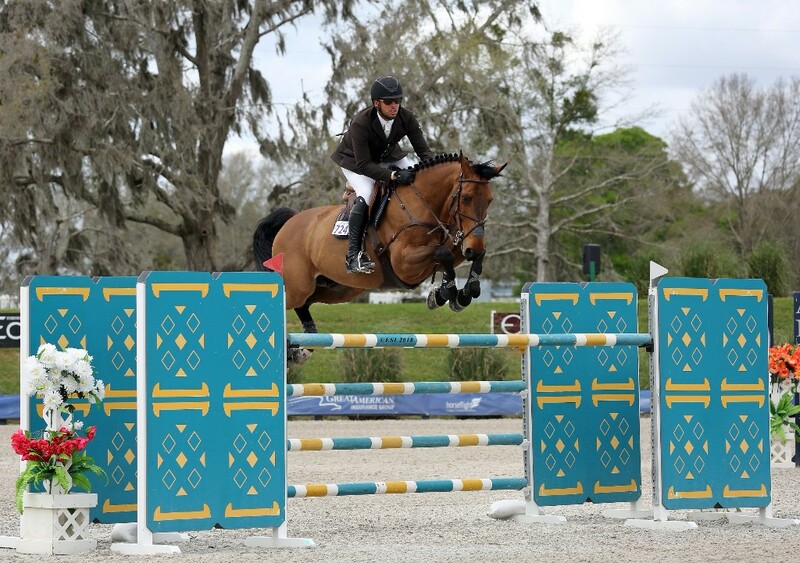 Emanuel Andrade and GRAND MAMUT, jumping to the first place finish in the $25,000 SmartPak Grand Prix. On Thursday, the $25,000 SmartPak Grand Prix took place with Emanuel Andrade, once again, taking home the first place award aboard GRAN MAMUT with a jump-off time of 38.748. In second place was Tracy Magness and INTENZ VAN HD with a jump-off time of 40.515. 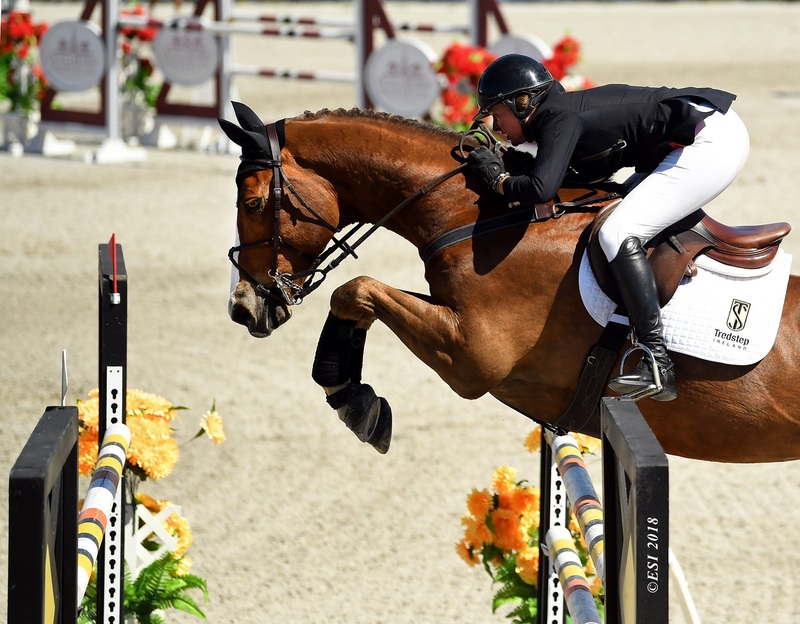 Third place was earned by Lisa Goldman and SOVEREIGN with a four-fault jump-off time of 39.715 and in fourth place was Canadian rider, Kyle Dewar aboard GOMEZ VAN DE WITHOEVE with a four-fault jump-off time of 42.394. Rounding out the top five was David Jennings aboard TYSON UNO with a twelve-fault jump-off time of 38.593. Friday started with Goldman and HINDSIGHT winning the $10,000 Open Prix with a jump-off time of 37.225. She also came in fifth place with CENTURION B and in a jump-off time of 40.433. Second place was awarded to Andre Thieme and FORAMI with a jump-off time of 38.460. Tromp came in third aboard EYECATCHER with a jump-off time of 38.985. Close behind was Tim Van Den Oetelaar in fourth place aboard EXITE with a jump-off time of 39.385. On Saturday afternoon, Andrade once again dominated the $10,000 1.35m Classic, winning the class aboard DIPSSY with a jump-off time of 38.238. 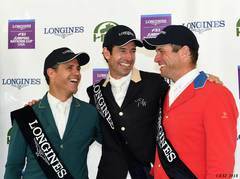 He also took the third and fourth place spots aboard CORTINA 186 and QUILINA VD LAARSEHEIDE Z with jump-off times of 39.990 and 40.262, respectively. Second place was earned by Manuel Torres and CHRISTOFOLINI H with a jump-off time of 39.117. Patricia Stovel rounded out the top five aboard CARIGOR Z with a jump-off time of 42.068. Callan Solem and VDL WIZARD, winning the $50,000 HITS Grand Prix. On Sunday, Grand Prix riders warmed up next to the Ocala Horse Properties Stadium in anticipation of the $50,000 HITS Grand Prix. More than thirty riders competed for the win, but only one would come out on top. Solem would be the one to take home the first place title aboard VDL WIZARD with a jump-off time of 40.818. Andrade was a close second with BON JOVI and a jump-off time of 42.035. Third place went to Thieme and CUPERTINO with a jump-off time of 42.902. In fourth place, Ocala local Aaron Vale once again found success aboard CASSEVEL with a jump-off time of 44.597. Dr. Fernando Cardenas took fifth place aboard QUINCY CAR with a jump-off time of 49.093. Alex Stevens and SKY PILOT, winners of the $5,000 Devoucoux Hunter Prix. The Hunter rings also had a successful Week VII, with many winners from the Low Hunters to the Hunter Prix. In the $1,500 Platinum Performance Hunter Prix, Katlynn Butler and MTM BAZINGA took home the first place award with a two-round total of 162.5. Second place went to Mary Stavola and NASHVILLE with a two-round total of 159.5. Only half of a point behind, Aliya Maker and US MARSHALL came in third place with a two-round total of 159. Kate Ellis and VALHALLA took fourth place with a two-round total of 157. Fifth place was awarded to Katie Eppinger and KEC FELIX with a two-round total of 154.5. The $5,000 Devoucoux Hunter Prix took place for another week, with some returning riders and some new faces, competing for the first place prize. Alex Stevens would be the one to take home the blue aboard SKY PILOT with a two-round total of 171. Shachine Belle came in second place with CYPRESS and a two-round total of 169. Third place was awarded to Chopping and CATCHPHRASE with a two-round total of 167.5. Chopping also took fifth place aboard CELTIC GOLD with a two-round total of 166. Lauren Schweppe took fourth place with COBELLINI 'F' Z and a two-round total of 167. HITS Ocala will be back this week for Week VIII and more exciting competition. Checkwww.hitsshows.com or follow us on our social media pages, to keep up with current results! *The Schedule for WCHR Week will allow for feature Hunter Classes and Classics to be held in the Ocala Horse Properties Stadium. Don't forget that the Great American $1 Million Grand Prix will be back Week X, Sunday March 25th!